CCP will unveil a monument dedicated to EVE Online's player base the day before its Fanfest 2014 event. EVE Online has been around for a decade and we feel safe in saying that there's pretty much no other game quite like it. Between its free-for-all experience and devoted player base, it's developed into an online experience that has, on numerous occasions, given birth to spontaneous moments and events that are wholly unique in the world of gaming. Just last month, for instance, the game played host to a battle that the developers are now toting as "gaming's most destructive battle ever." It's moments like those that have inspired CCP to announce plans to build a real-world monument commemorating the game's first ten years and "honor those who have participated in establishing [its] massive virtual universe." The monument, which will be built in the downtown harbor of Reykjavik, Iceland will be built on top of a half-meter metal-plated concrete platform. The platform will be inscribed with the names of all active EVE Online members prior "as captured on March 1st, 2014." It will also include the names of EVE players who have passed away over the past ten years. A web-based application will be developed to help find specific names on the platform's surface. A laptop buried underneath the monument's structure will also "serve as a time capsule with videos, messages wishes and more from the players and the development staff." "Our intention is to immortalize the contributions of the millions of people of the EVE universe in a way that extends beyond their immortality in our games", said CCP's CEO, Hilmar Veigar Petursson. "We are humbled by all those that have joined us on the journey so far, and it's our hope that this physical piece will continue to gather energy and relevance into decades to come, becoming like EVE Online and outliving us all." 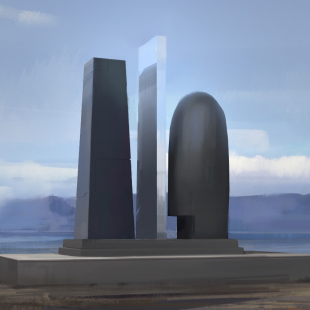 CCP currently plans to unveil the monument on April 30th, a day before its Fanfest 2014 event. The monument itself will be a sculpture by artist Sigurour Guomundsson, who will be working with "help and input" from EVE Online's art directors.